Not all marijuana seeds are created equal. it’s essential that you start out with high quality seeds from the right strain. Plus, what types of seeds will be best for your specific grow-setup. You're getting a list with the most trustworthy and reliable seedbanks and breeders in the world. Maybe you're not exactly sure what the key differences are between autoflowering and regular seeds. If you want to know all the pros and cons of autoflowering seeds vs regular seeds, in this chapter you will learn exactly that. Without any change in their light cycle. 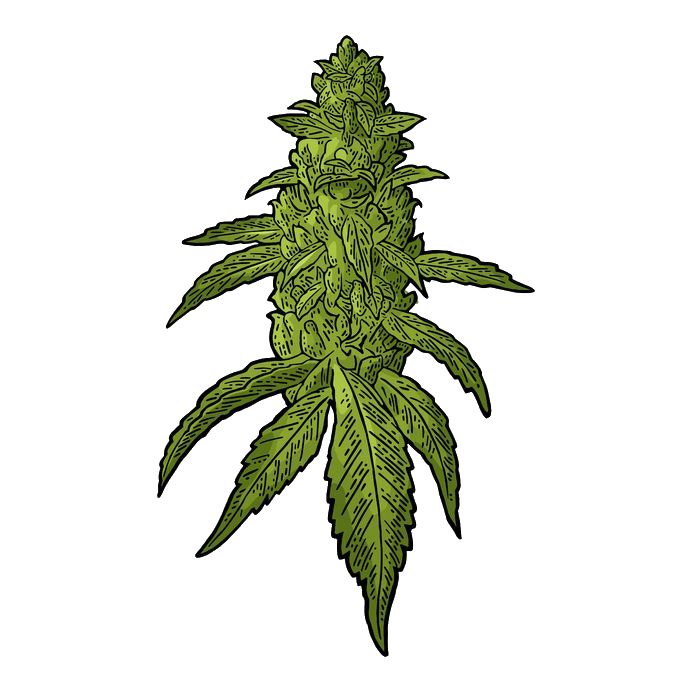 Today, autoflowering seeds are up there with regular photoperiod seeds in terms of potency. There are pros and cons for both options, and what you will choose, essentially is dependent on your specific setup and your growing skill. Better suited for stealth growing, because of limited height and size. Less forgiving as you have no control over the start of the flowering process. If you mess something up right before the flowering stage starts…you potentially mess your whole crop up. Can’t clone easily. You’ll always need extra seeds for additional plants. But they can be a great option if you're looking for results fast or have very limited growing space. Slower harvest cycles (at least 2-3 weeks slower). Photoperiod seeds are better suited for the beginning grower, or any grower who's looking for massive yields. Get photoperiod seeds and grow a few massive plants by training methods and extending the vegetative stage for a very long time. If you’re starting out, I recommend you start out with regular photoperiod seeds. Because these seeds are much more forgiving in case of mistakes, you'll have a higher chance finishing your first few grows successfully. And if you think you won't any mistakes during your first grow, think again: small mistakes can creep in anywhere during the growing process and potentially influence your end-yield significantly. Don't hesitate to get autoflowering seeds. It's not like they are MUCH harder than photoperiod seeds, still the same growing essentials apply. Just keep in mind to be a bit more diligent and stick to the rules, tips and tricks that you can find here. You need female marijuana plants. Only female plants produce buds. Are looking to breed new types of strains. In this chapter you will learn everything about the key-differences between feminized seeds and regular photoperiod seeds. When you get regular photoperiod seeds, on average, there’s a 50% chance your seed will grow into a male plant. So if you get 10 seeds this translates to only 5 seeds, which will grow into bud-producing female plants. That’s not not the only potential issue with photoperiod seeds though. 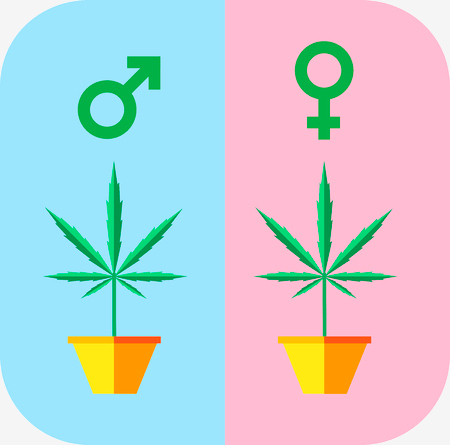 If you forget to remove the male plants on time and you're female plants get pollinated, they will produce seeds and less potent buds (the energy and nutrition normally used for the buds is now going into the seeds). Feminized seeds will always turn into female plants (unless you really stress them, then they might turn into hermies). So why would you ever risk getting male plants by getting regular photoperiod seeds, if you’re not looking to breed and/or create new seeds? Well, some growers say that feminized seeds have a higher chance to turn into a hermie plant (basically a sexless plant with reduced yield and potency). If you get high quality seeds from reputable seedbanks, in our experience, these cons are non-existent and feminized seeds will give you the same results as photoperiod seeds. Feminized seeds are the way to go. If you particularly like one of your female plants, you may want to secure her offspring. By pollinating her with one of your male plants, you'll make sure it will produce a large amount of seeds that you can use in the future. Do realize that you will hurt your yield severely, and only opt to go for this if you don't care about wasting the yield of one of your plants (what you get back is free seeds though!). In the long run, creating your own seeds obviously is much cheaper than buying marijuana seeds from seedbanks. But if you're just starting out, we highly recommend to keep things simple and start with feminized seeds. This is only for advanced growers. If you want to experiment, and breed your own strain, mother nature made this possible for you. The way you do this, is by pollinating the female plant of one strain, with the pollen of the male plant of another strain. Let's say for example you have a White Widow plant and a Purple Kush plant. You feel that the effects of your Purple Kush plant are too sedative. You want to know how the effects would be of a strong sedative strain like Purple Kush with the more uplifting effects of White Widow. To breed a cross between these 2 strains, you can pollinate the Purple Kush female plant, with the pollen of the White Widow male plant (or vice versa). The Purple Kush female plant, will now create seeds, which have characteristics from both these strains. Cannabis has grown in wild nature for probably millions of years. And not every strain will grow easily in every climate. ​In this chapter, you will learn everything about strains that grow well indoors vs outdoors and what climates are suited for what strains. Especially for indoor growing, certain strains are just not compatible with the grow-setup of most indoor growers. Will be a difficult undertaking for the average grower growing indoors. In that case, get Indica-dominant strain seeds. Indica's naturally grow in colder climates. They originate from the Hindu Kush range, which is a mountain area with a cold climate, on the border of Afghanistan and Pakistan. It's written in their DNA to withstand colder temperatures. Indica-dominant strains are short and compact, which means they need much less space and are just more sturdy plants in general, which in turn means they are more forgiving in case of mistakes like giving them too much/little light or over-/under-watering. You are going to make some mistakes in your first grow. If you do have access to a lot of space and light, don't feel discouraged to grow Sativa-dominant strains. Although they're harder for the beginning grower...if you grow a bit more diligently, while keeping all the basic growing essentials in mind, there's a very big chance you'll grow one successfully. And this specific chemical make-up of a strain, 100% decides the effects that it produces when you vape, smoke or eat it. You have countless choices when it comes to choosing your specific strain...and it can be difficult to make the right choice. 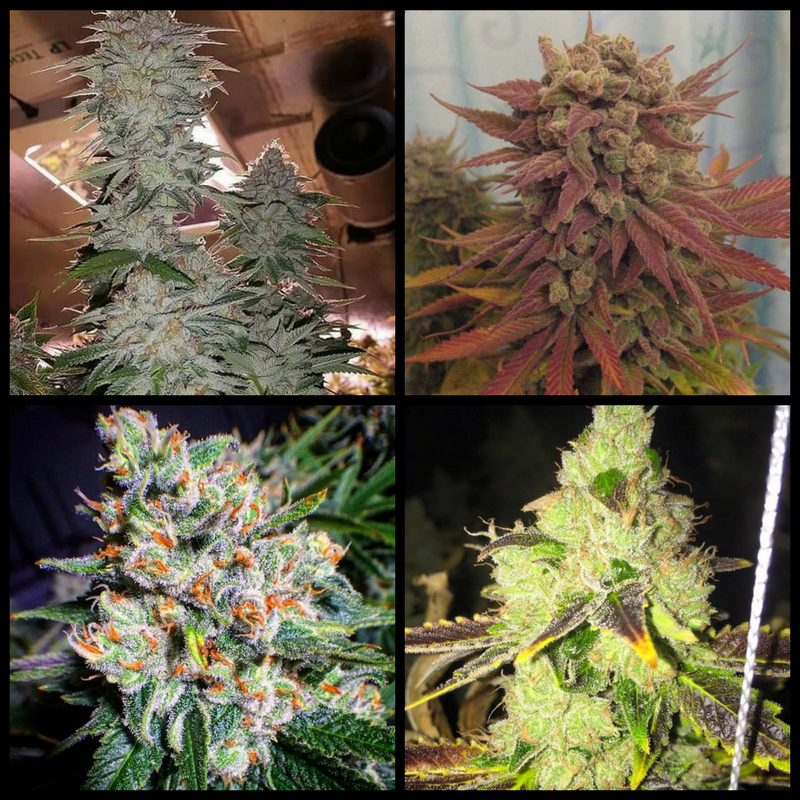 In this chapter you're going to learn the main types of strains and their effects, so you will get the perfect strain for the effects that you're looking for. While on other occasions you felt uplifted and energetic? Well, this is probably because of the difference in strains you used (of course your mental, emotional and physical state before you start using it, also plays a role). There's no 'better' choice, the right strain all depends on your specific preferences. Both will produce different mental and physical effects. In the previous chapter, you already learned that Sativa strains don't grow well indoors because they grow so tall and need lots of intense light. They produce very different mental and physical effects. If you mostly want energetic, uplifting and mentally stimulating effects, Sativa-dominant strains would be your best bet. There are even creative artists and writers, who use Sativa-dominant strains for inspiration...yes, Sativa's can indeed give you a creative boost as well. One potential downside of Sativa-dominant strains is, that they usually contain a very high level of THC and very low levels of CBD. The psychoactive effects of Sativa's can be too intense for some...and in worst case, could lead to feelings of paranoia. Sativa-dominant strains are definitely the way to go. In the previous chapter you learned that Indica-dominant strains are the easier strains to grow indoors (because they are compact and don't need absurd amounts of light). 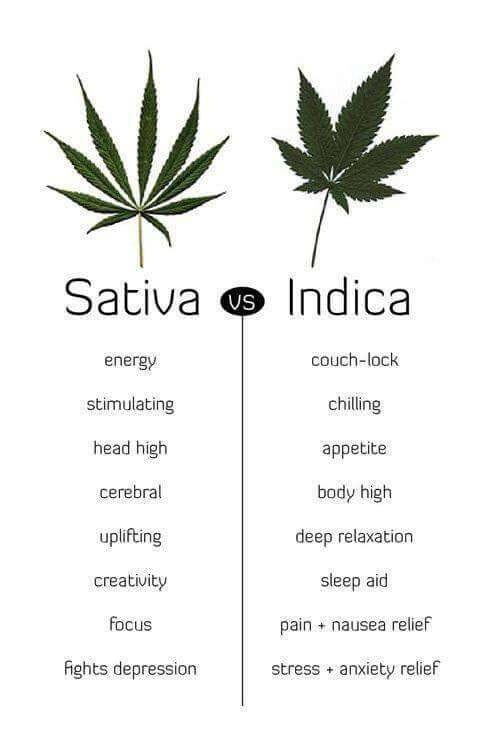 Indica's have different effects than Sativa's. Sativa's are energetic and uplifting, while Indica's are more relaxing and sedative. They are your best aid if you're suffering from insomnia or anxiety. They not only relax the body but also the mind. Indica's put your mind at ease and make you enjoy the moment like no Sativa can do. Indica's can be physically too overwhelming and can put you in the dreaded 'couch-lock', where you're glued to your couch and extremely unmotivated to come off of it. If you would want to do any activities that require some form of analytical mental capacity, it's also best you avoid Indica's. Yes, they relax the mind, but they also dull it a bit, lowering your analytical and cognitive capabilities. Indica-dominant strains are the way to go. These strains still deserve their own section. The thing that differentiates them from regular strains: having a very high % of CBD, makes the difference between Sativa and Indica, much less apparent. CBD has no psychoactive properties, in fact, it will temper the effects of THC and will mostly produce physical effects. And this in turn suppresses the differences you would normally feel between Sativa and Indica strains. Over the past decades, CBD has been shown to be an extremely potent medical agent, good for treating countless of conditions and their symptoms. But regular strains didn't contain therapeutic amounts of CBD, so high-CBD strains had to be specifically bred. But if you're looking for the medical effects of CBD, you need therapeutic amounts of CBD. Avoid CBD-strains, as they really temper the effects of THC and CBD strains have lower percentages of THC in general. Most of them very shady, non-transparent and untrustworthy in general. When you get seeds you want to be 100% sure, you’re getting quality seeds that will result in strong bud producing marijuana plants. In this chapter you will learn the best places to get your marijuana seeds. Or even worse: get scammed and lose your money. Yes, the last one does happen on a more frequent basis than you would think. 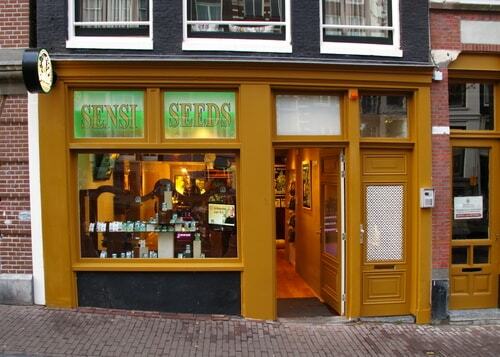 Brick & Mortar Seedshop of SensiSeeds in Amsterdam. There's a very big chance you're going to get scammed. The only way to ensure your quality is to buy from reputable seedbanks which have proven they’re reliable and supply quality seeds. It also helps if the prices are fair, the seedbank carries seeds from well-known breeders, and the customer-support is amazing. 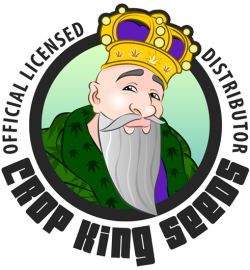 Crop King Seeds is a Canadian-based breeder and seedbank at the same time. When you're just starting out, it's best if you start with something cheap but reliable. Unless you're lucky, mistakes will be made and crops will be killed. When talking about cheap but effective seeds, Crop King Seeds is the number 1 value-for-money seedbank that you will find. Their seeds have very high germination-rates and they grow into good quality plants, yielding proper buds. Their customer service is also on point: you can order from these guys with a great peace of mind, knowing if anything goes wrong, they will make sure to keep you a happy customer. The next seedbank is for you. Seedsman is UK-based seedbank. They don't breed any seeds, but simply carry seeds of some of the most well-respected breeders like Greenhouse and HumboldtSeeds. This is probably the seedbank with most choice in terms of strains and breeders. You will find literally every strain in any form or shape (feminized, autoflower, CBD strains, etc.). The prices are also very fair. 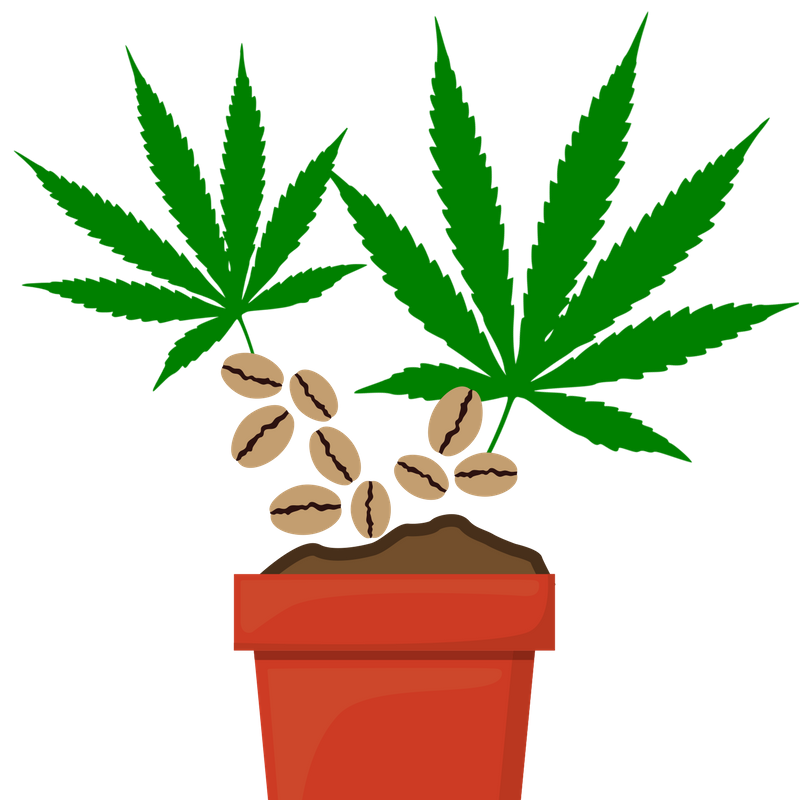 If you order seeds with regular shipping, there's a significant chance, customs will confiscate your seeds (even though marijuana seeds are legal almost everywhere in the world!). If you're located outside the UK, be absolutely sure that you order with stealth shipping. This seedbank as well has great customer service and will load you up with great deals and freebies at times like Halloween and Black Friday. And in case of problems, you can absolutely count on their customer service: it's stellar. They have very fast shipping times, even if you're located in the U.S. or Canada! SensiSeeds is one of the oldest, if not the oldest breeders and seedbanks in the world. They're located in Amsterdam and are one of the largest seedbanks: they carry over 500 varieties of strains! You'll be in for a pleasant surprise. Some of their strains are selected by the Dutch government to supplied as prescription medical marijuana. SensiSeeds really perfected their strains over a period of decades and you will be hard-pressed to find a strain that won't impress you. They don't ship to the U.S., Canada or Australia. 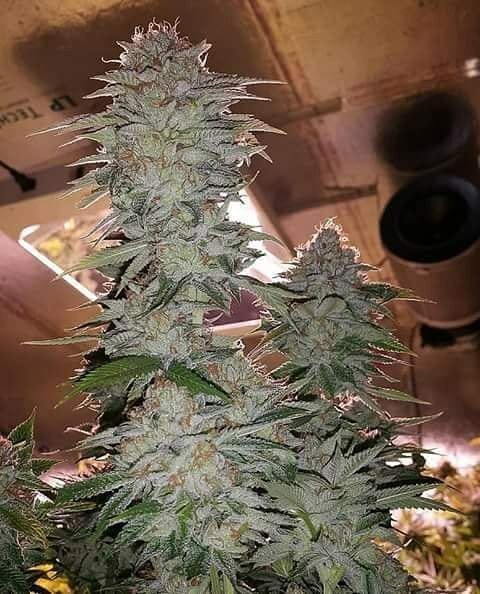 But if you're based in Europe, SensiSeeds seeds are some of the highest quality seeds you can get, for a very fair price. Note: If you are located in the U.S., Canada or Australia and want to try SensiSeeds, order them from Seedsman! If you're looking for one in North America, look no further. Just realize getting top quality seeds from the best breeders, is going to cost you more as well (for a list of the best breeders check below). 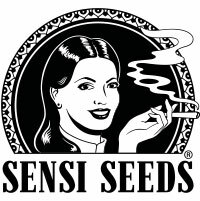 They quickly build a great reputation by offering seeds from the best breeders for fair prices...while providing great customer service and fast and discreet shipping, especially if you're located in the U.S. 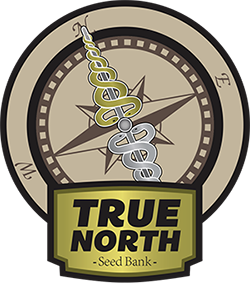 True North Seedbank is the seedbank you should check out. Is there a difference between seedbanks and breeders? But definitely not all seedbanks are breeders. 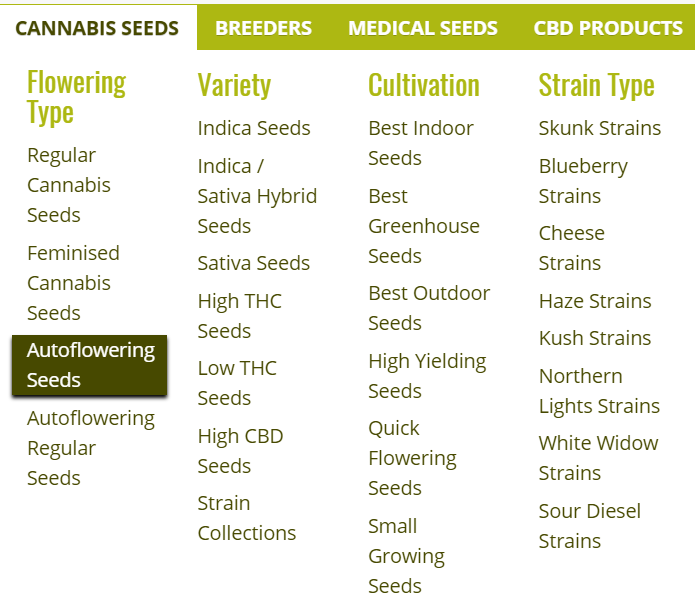 Breeders are the guys that breed the different strains that you know about like White Widow or Jack Herer, and seedbanks are the guys that sell them (but as said before most breeders also are seedbanks as they sell their own seeds). But as you might've expected, there’s also a difference in quality between the strains of different breeders. This list is not exhaustive and there are many more quality breeders, but these are the ones we personally tested and absolutely loved. So when looking for the best seeds, get seeds from these breeders (our listed seedbanks provide all of these). At least at some point, you probably want to be germinating them. 90% of growers want to start out growing with more than 1 plant. Usually it's in the 3-6 range. Now, the easiest way to get the exact number of plants you want, is to just order the number of seeds corresponding to the number of plants you want, PLUS a few extra in case 1 or 2 of your seeds don't germinate. In this chapter, you're going to learn the pros and cons of getting marijuana seeds vs cloning and what seeds you should get if you think, there's a chance you might ever clone. 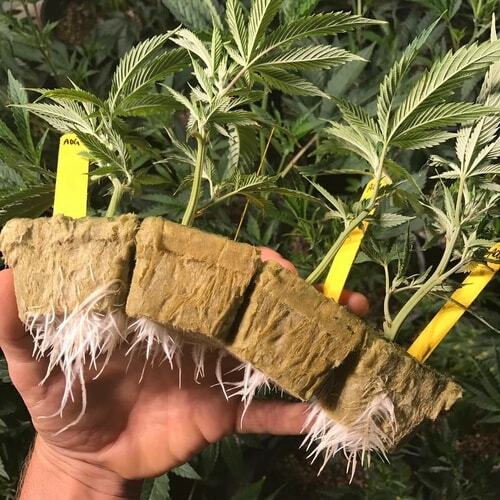 When you clone your marijuana plant, you essentially make a copy of it by cutting of a piece off of it, planting it and letting it develop roots. This result is close to an exact copy of your mother plant, except for genetically. Genetically, you're 100% sure you're having an exact copy (which means the buds it produces will produce the same physical and mental effects). Starting with marijuana seeds is the most practical option for most of you (If you're living in a state or country where growing marijuana is 100% legalized, you could also start by buying a clone from a dispensary or a cloner). Let's say you start out with a few marijuana seeds. You cut off a branch of the mother plant which is well suited for cloning, and plant it in a root riot starter cube. Over time, this branch will start to develop roots and grow into a full-fledged, bud-producing plant. It doesn't matter whether you get feminized or photoperiod seeds, as long as they're not auto-flowering, you're good. When cloning from photoperiod seeds, just make sure you're actually cloning a female plant...otherwise you won't get any buds (only female marijuana plants produce buds). Autoflowering seeds are trickier to clone. And won’t have enough time to grow before it comes into the flowering stage, which means its yield will be abysmal.